SHANGHAI - Danish firms are flourishing in the Chinese market as commercial ties deepen between Denmark and the world's second-largest economy. Danish companies have carved out a niche for themselves in a broad swath of Chinese industry sectors, including logistics, food and beverage, food ingredients, furniture manufacturing and retail. 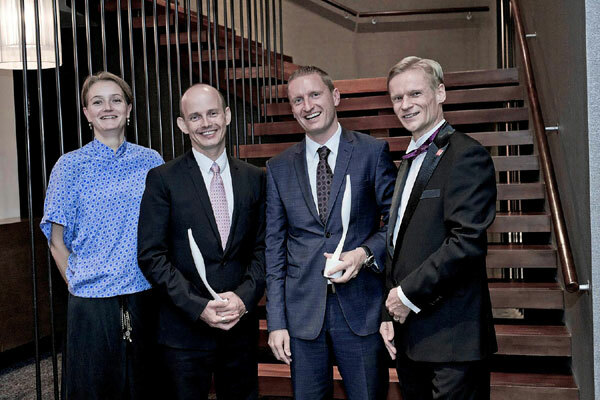 Several of Denmark's most prolific businesspeople in China were recognized Saturday at an annual business awards ceremony hosted by the Danish Chamber of Commerce in Shanghai. Simon Lichtenberg, chief executive officer of the Shanghai-based Trayton Group, was awarded Entrepreneur of the Year. The Trayton Group is one of China's largest furniture manufacturers and retailers with four factories, twelve stores under the BoConcept name and more than 2,500 employees. Lichtenberg first came to China to study Mandarin at Fudan University in 1988. He founded the Trayton Group in Shanghai in 1995. Last year, the company launched the Danish luxury lifestyle brand Georg Jensen in China. Lichtenberg advised aspiring foreign entrepreneurs at the ceremony to take heed of their Chinese competition. "I would recommend that you get into an industry that does not have thousands of Chinese competitors," he said. John F. Christensen, founder of the Wagas café and partner in the freight forwarding supplier Prime Cargo Denmark, won the Business Person of the Year award. Christensen launched Wagas in Shanghai in 2000. The café has since grown more than tenfold and today there are 22 outlets throughout the city. Next year, Wagas will expand outside of China's commercial hub. Christensen and his partner Jackie Yun operate a total of 40 different restaurants and bakeries in Shanghai employing 1,000 people. At the end of the year, Christensen will launch Peak Wines, a wine importer that will sell to Shanghai restaurants and the retail market. Finalists for Entrepreneur of the Year included Casper Tollerud, chief executive officer of the travel agency Genuine China Tours and Simon Gjeroe and Lars Ulrik Thom, owners of Beijing Postcards. Genuine China Tours creates customized travel packages for Danish clients. Gjeroe and Ulrik Thom's company produces postcards and stationery featuring vintage China photos taken between the 1880s and 1950s. Torben Nielsen, chief executive officer of Kopenhagen Fur and George Kahwati, China general manger of the shoemaker Ecco, were finalists for the Business Person of the Year award. Kopenhagen Fur is the world's largest fur auction house with a 60 percent share of the global market. Ecco has more than 600 shops in 31 Chinese provinces. Danish companies large and small have much to offer China, said Christian Overgaard, vice president of Asia-Pacific, Middle East and Africa at Chr. Hansen – a food ingredient company - and chairman of the Danish Chamber of Commerce in China. "Sino-Danish cooperation will be focused on innovation and quality moving forward," he said. "For one thing, I think we will see Chinese and contemporary Danish designers teaming up." "Another area with strong potential for cooperation is automated production. Companies that want their costs to be competitive and still manufacture on the east coast of China will need to move in that direction," Overgaard said. Denmark can export the machinery required for automated production to China, he added. Denmark can also utilize its expertise in energy efficiency services to support China's environmental protection efforts, Overgaard explained. "Water cleaning would be highly beneficial to Chinese rivers," he said. Overgaard believes China and Denmark can cooperate on food safety as well. The Danish foreign ministry recently arranged for a Chinese government delegation to visit Denmark and meet with Danish food safety experts. The exchanges between the two sides were fruitful, Overgaard said. "Denmark's foreign ministry has its largest global presence in China," said Susanne Hyldelund, the Danish consul general in Shanghai. "We offer strong support for two-way government exchanges and the business community." The number of Danish companies operating in China has more than doubled from 231 to 465 since 2003, wrote Jesper Kamp, head of the commercial department at the Danish embassy in Beijing, in a research note. Shanghai, meanwhile, is home to one of Denmark's four Innovation Centers worldwide, the others located in Silicon Valley, Munich and Hong Kong, Hyldelund said. The Innovation Center Denmark in Shanghai acts as a conduit between Danish research institutions and companies and their Chinese counterparts, focusing on cleantech, life science and information and communication technology (ICT), she added. Looking ahead, Overgaard believes China will be a long-term source of growth for Danish companies as a center for sourcing, outsourcing and R&D. "Eventually, I think China will also evolve into a global talent pool for Danish businesses," he said.